If you’ve been reading my blog for a while, you know how I feel about the whole idea of calling cancer a gift. As my friend Rachel used to say, “If someone says cancer is a gift, they’ve been drinking the chemo.” Rachel had such a great sense of humor. I miss Rachel’s wisecracks. I miss Rachel. Some people believe their cancer is a gift and aren’t afraid to say so. That’s fine. 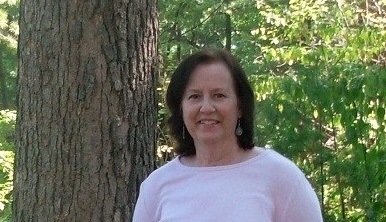 Everyone has the right to live and express their own cancer truths, but as for me, I will never call cancer a gift. Never. I am grateful for some things and for many people that have come into my life following my diagnosis, but those things and those people are the gifts, not cancer. In my mind there is a huge difference. One of those “things” that came into my life post-cancer diagnosis was a little black and white cat named Ninja. I’ve always been a dog person. I grew up with dogs and have always had a dog as an adult as well. I didn’t care much about cats. I didn’t dislike them. I just didn’t like them, or so I thought. Dear Hubby on the other hand, has always loved dogs and cats. He’s been telling me for a fair number of years that we really should get a cat. My answer was always no. I always had the same reasons excuses; cats are aloof, cats aren’t friendly, cats don’t care about people, cats walk on your counters, cats scratch up your furniture, cats need litter boxes, cats don’t like dogs and the biggie – I’m allergic to cats. After Dear Hubby stood by me through the recent chaos of cancer, I decided well, why the heck not get a cat? Dear Hubby deserved a cat and a whole lot more. Plus, about a year ago Dear Daughter was fostering a certain tiny black and white cat that no one wanted. You know where this all ended up don’t you? Lots of “talking mom into a cat” dialogue ensued. The surprising thing was the small amount of “talking into” that was needed. Exactly one year ago, Dear Daughter delivered our new little black and white fur bundle all the way from Fargo, North Dakota. This kitty was petite as cats go. We didn’t know where she came from, how she became homeless or exactly how old she was. She did appear to be young, healthy and very feisty for someone so small, hence the name Ninja. She’s our little Ninja warrior. Almost immediately, I realized I had been wrong about cats. Just as with dogs (or humans) it’s never fair to make sweeping generalizations. Some cats are aloof, but not Ninja. Some cats are unfriendly, but not Ninja. Some cats scratch up your furniture, but not Ninja. Some cats walk on your counters, but not Ninja. (okay, she does this once in a while, but not very often). Some cats don’t like dogs, but Ninja does (big relief here). Some cats don’t care (or pretend not to care) about people, but Ninja clearly does and isn’t one bit concerned about keeping up the appearance of aloofness. In fact, Ninja loves people. Well, because she “tells” us all the time. Ninja is a meower. You’re probably saying, all cats are meowers, right? Well, Ninja meows a lot and I mean A LOT! Everyone who meets Ninja says she is the most vocal cat they have ever seen heard. Who knew cats had so much to say? Who knew someone so tiny could quickly garner so much attention and power influence within a household formerly “ruled” by dogs? 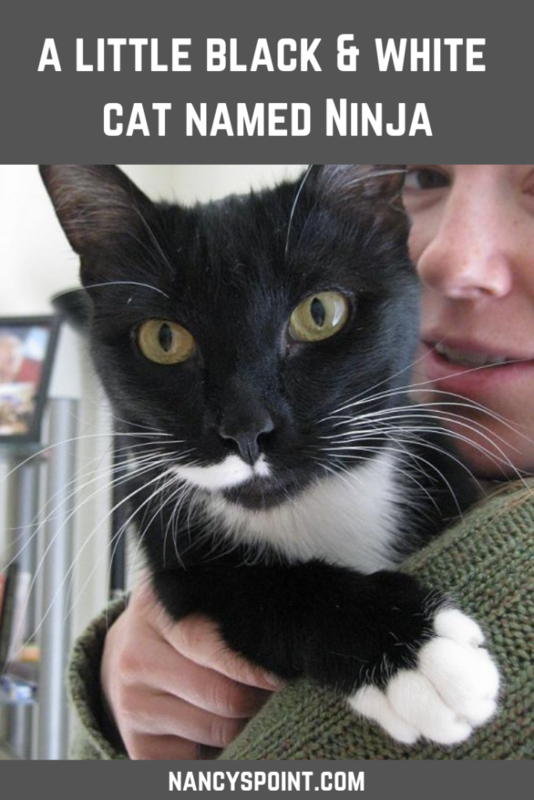 And who knew a little black and white cat could so easily wiggle her way into our hearts? Though my dogs still take “top billing,” Ninja ranks right up there. No, cancer is NOT a gift! But our little Ninja warrior is. To read more of Ninja’s story, check out this heartwarming post from That Mutt. Have you ever adopted a pet from a rescue facility? How do you feel about calling cancer a gift? Sign up for weekly updates from Nancy’s Point! Who says cats and dogs don’t get along? I LOVE Ninja! She is so cute! I am glad you have her. Laura, Thanks. I’m glad we have her too. Ninja sounds wonderful 🙂 And how great that she takes naps with the dogs? This was most certainly a warm & fuzzy post. Thanks for sharing, Nancy. Catherine, I know, it’s really amazing how well all the animals get along isn’t it? Thanks for reading and commenting. Love, love, love you, Ninja! I don’t see cancer as a gift, but I understand why someone would think otherwise. I’m probably more of a dog person than a cat person. Dogs seem to like me more and cats seem to like my fiance more. Lindsay, Yes, dogs will always take “top billing” for me, but I do have a whole new appreciation for cats, or at least for this one! Thanks for bringing Ninja into our lives. I call cancer the ‘gift that keeps on giving’. Our cat was my chemo buddy. After each round we would zone out together. He would follow me around and insist on keeping me company. Caroline, I’m glad you had a cat chemo buddy. I think cat’s would be terrific in that role. We didn’t have Ninja yet when I was going through chemo. My dogs were great, but a tiny kitty would have been nice to snuggle with. Thanks for sharing. Well, you KNOW how I feel about cats — and dogs — Nancy! No, I don’t think and never will think cancer is a gift. But my furkids have helped keep me sane through it all. And that has certainly been a gift. 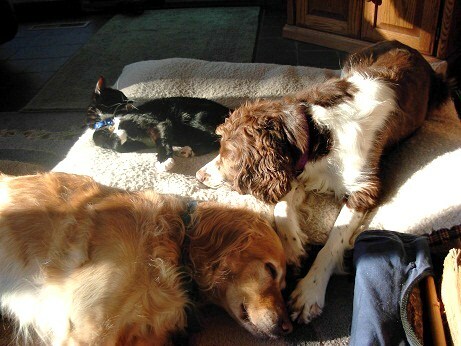 The three oldies who were with me when I was diagnosed have all gone now, my dog Foxy and my kitties Chloe & Jett. But I have two kitties now, Fiona & Teddy, who continue to work their magic. All of my pets in adulthood have been rescued in one way or another. Some of them came via the local pound. Some came via friends who had pets that they couldn’t keep anymore. I love adopting adult pets now (although some of my adoptees have been relatively young). They have all been universally grateful & happy to be given a 2nd chance. Kathi, I do indeed know how you feel about your “furkids!” Love that term by the way! I’m sorry your three oldies are gone now, but you’ll always have those lovely memories of them helping you to get through those tough days. I’m glad you have Fiona and Teddy now to continue working their magic. And yes, adopting adult pets is pretty rewarding. Knowing you are giving an animal a second (or third) chance is a wonderful feeling. Thanks for stopping by. Cute kitty! I was the exact same, but with dogs. Didn’t know them; didn’t care to know them. My husband felt differently and I gave in after radiation. Now we have a sweet little lab and I’ve been converted. Funny how these extras slip into our lives because of cancer. Praelior, I guess we are opposites then in our pet experience aren’t we? So glad to hear you have a sweet little lab and that you’ve been converted. I think that’s great. Any kind of pet can work special magic during cancer, or during life period. I don’t think I’ll ever be without a pet of some kind. Thanks for sharing. I grew up with an Alsation, so I love dogs. We were so devastated when she left us we couldn’t get another. I worked a summer while at college for a kennels and loved each and every hound. We moved out into the country where as kids me and my brother went roaming, including up to the uninhabited farm a field away. There we discovered our own Ninja (a tabby) with semi-wild kittens. We spent our time catching them. Mum cat saw where we went with our gifts of milk. So she followed and moved in, kittens and all. Carried each one by the scruff of its neck all the way down the lane. That was it, we owned a cat (and kittens, which we managed to find homes for), she’d decided the matter. After that we were never without a cat or two. So I’m both – a dog and cat person. All our cats have come from rescue homes – those that didn’t adopt us that is. Cancer is not a gift. Lynne, I am not familiar with what an Alsation is. I will have to look that one up. Great story you share here about how you came to adopt a certain cat family. Or perhaps they adopted you! Glad to hear from another dog and cat person. Thanks for sharing. And yes, cancer is SO not a gift. Ann, Pets do indeed add so much. I can’t imagine living without at least one pet. Your comment about your dog being afraid of the ceiling really cracked me up. My golden has a few fear issues, but hey, don’t we all? Thanks for commenting. Nancy, Ninja is just the cutist cat! I love how you focus on her life to the exclusion of the cancer. I’m more of a dog person than a cat person. I currently don’t have a pet, but I have my teddy bear, who sleeps with me and watches over me. He’s my current gift, courtesy of my dear departed mom. We adopted two dogs from a rescue facility back in 2002. They are now with my husband. They are so cute, and I miss them very much. Jan, I’m still more of a dog person, too, but I do love our Ninja! I bet you do miss your dogs, Jan. It’s sweet you have a teddy bear from your mom to “watch over” you. Thanks so much for sharing. Great post, Nancy! Your cat Ninja looks a lot like my cat Hemi, even the unique white marking on the face! 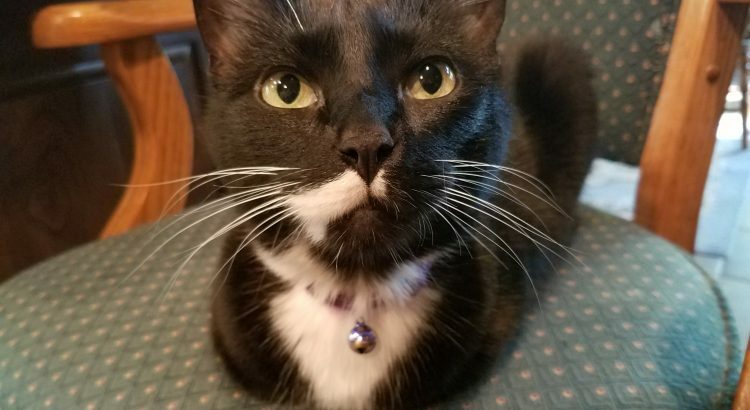 Ninja is actually a tuxedo cat (black and white), as is my Hemi. I also have a brown tabby named Cosette. I’ve always been a cat person, although I like dogs. Cats get a bad rap — a lot. Many cats are affectionate and sweet and love people. My kitties are wonderful pets. It’s the same thing about dogs: some dogs are vicious and mean and scary, but many are not. So you are right: generalizations shouldn’t be made about a particular animal. Beth, I remember you have a cat that looks a lot like Ninja. Something else we have in common! Cats do get a bad rap pretty often, but you’re right, dogs do too I guess. It’s never good to make generalizations about anyone – including the four-legged species among us! Thanks for your comments, Beth. I think rescue pets are absolutely the best! So does our cat Tiger Lily. You can read her story on her facebook page. (she claims to be royalty) No matter what happens, pets can always bring joy into someone’s life! Dianne, Oh that must have been so hard to lose your dog in the middle of cancer treatment. I’m sorry. I’m glad you found a lovable cat to adopt too! That’s great. It sounds like you have quite a houseful of pets! I thought we had a lot! You’re so right about the joy pets bring into our lives. And they don’t ask for much in return do they? Sorry about your hubby. Hope he’s doing okay now. Thanks so much for reading and taking time to comment, Diane. Glad you enjoyed the post! “Help Me Live – 20 Things People with Cancer Want You to Know,” A Book Review & Giveaway!